If, for some reason, you want to use two SIM cards on your brand new iPhone 6 or 6 Plus, you can do so using this Dual-SIM Adapter. A brand called MagicSIM is now selling a Dual-SIM adapter for the iPhone 6 and 6 Plus, enabling you to use SIM cards from two different carriers. The MagicSIM Dual SIM adapter doesn’t allow for simultaneous use of both the SIM cards. You can, however, switch between networks whenever you feel like. Also, since iPhones have never come with a Dual-SIM option, this accessory will be an extra physical addition on the iPhone 6 and 6 Plus. 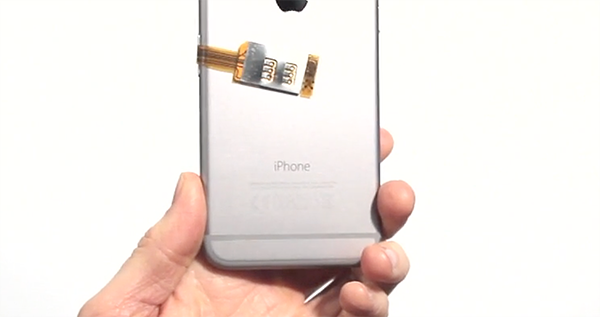 One end of the adapter goes into the SIM slot on the iPhone and the other is visible outside and supports a regular sized SIM card. It’s best to fold the rest of the adapter and use a case to conceal it. Of course, you’re going to need an unlocked iPhone 6 or 6 Plus to be able to switch between different carriers. If you’re using different numbers of the same carrier, then you could do with a locked iPhone. Changing your preferred carrier is as easy as going to Settings>Phone>SIM and selecting the SIM. The adapter supports all networks such as 3G, 4G, LTE, GSM, GPRS, EDGE, CDMA, UMTS, WCDMA and HSDPA. Interested? The MagicSIM Dual SIM adapter for the iPhone 6 and iPhone 6 Plus both cost £24.99. i cant get this to work because it will not let my sim tray return all the way back in. Great product, really happy with mine… works perfectly!